The iconic nameplate that said arrivederci in 1982 has finally returned to American roads. But this time it’s made the trip across the Pacific Ocean. 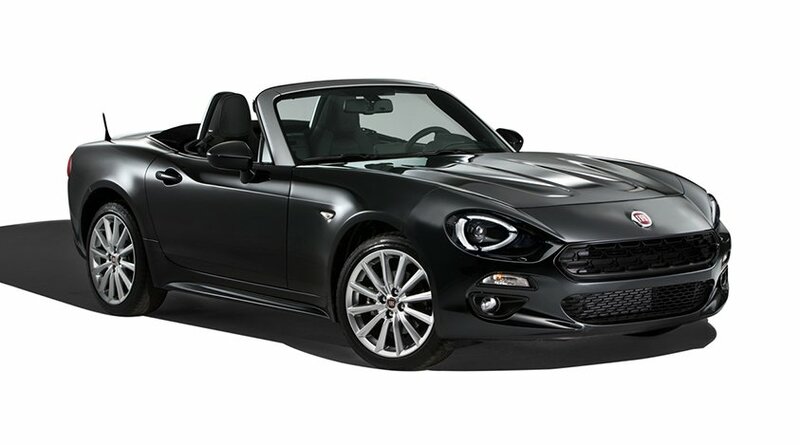 In order to build a sound business case for a low-priced, low-volume sports car, Fiat hooked up with Mazda to produce the 124 Spider on the bones of the Miata in Japan, but only after sister company Alfa Romeo broke up with it. The initial plan was to use the Miata as the template for a new Alfa Romeo Spider. But the top brass decided that all new Alfas will be purebred Italians, so Fiat inherited the project, leaving fans of “The Graduate” at the altar. There’s no telling what that car would have looked like, but this one packs plenty of stylized heritage 124 Spider cues into a body that’s entirely different from the Miata’s, even if its petite proportions are largely the same. There are the recessed headlights, the rectangular taillights, the wide mouth grill, the chrome windshield frame and those elegant character lines running down the sides and leaping over the rear wheels. It also has the 124 Spider’s signature power domes on the hood, but they’re just for show. There’s no classic twin-cam to clear, or the Miata’s naturally aspirated motor. Instead, the 124 Spider gets the 160 hp 1.4-liter turbocharged four-cylinder firecracker from the racy Fiat 500 Abarth, with either a manual or automatic transmission, both with six speeds. The snug cabin is a near clone of the Miata’s, but with soft-touch materials on the dash and doors, new gauge faces, richer upholstery, a chunkier steering wheel and extra stuffing in the seats. Unlike previous 124 Spiders, there are only two. It’s the most telling artifact of the Alfa-Fiat switcheroo, but it hardly matters. Those back seats were teeny. Even with all of the updates, the 124 Spider remains one of the lightest cars on the road today, weighing just about 100 pounds more than the ultralight Mazda. Their prices are also roughly the same, with the Fiat’s starting at $25,990. On the move, both cars feel as distinctive as they look. The 124 Spider has a more relaxed suspension that’s still plenty sporty, but it’s laid back compared to the Miata’s hyperactive “where’s the nearest autocross?” setup. Combined with the softer seats, it makes it a less taxing car on long trips (where it gets 36 mpg) and a beaut bumping around town. The engine adds its own flavor, with an exciting, torquey turbo boost replacing the light and linear power build of the Miata’s naturally-aspirated four. You can even hear the turbine spinning away, mostly because the exhaust isn’t very vocal. But the higher performance 124 Spider Abarth model comes with louder pipes and a tighter suspension for $29,190, and there’s always the MOPAR parts catalog, for you DIY types. But your neighbors will appreciate the sotto voce edition, and you’ll still get plenty of attention. People literally cheered the car as it drove by, most not knowing what it was, since it’s so new and a rare sight on the road. That’s never happened to me in the Miata. Above all else, the 124 Spider has flair. Those that did pick up the Fiat connection went into an immediate trance, reminiscing about the one they had or almost bought back in the day. The modern car’s country of origin wasn’t an issue for any of them. Given the original’s reputation for quality, it was often seen as more of a plus. I don’t expect that more than a handful of people will intentionally cross-shop the Miata and the 124 Spider, but for those who do, it’s a simple choice: If you want to win races, buy the Mazda.